I'm still plugging away at those Ocean Waves blocks. Only twelve more to go! I'm still making them one block at a time so I can plan my pressing to make things nest to help me match seams, but I have a good routine so each block is getting made faster than the previous one. This is not progressing as quickly as I had hoped, but once I had this idea in mind nothing else would do. The only thing to do is keep at it! It will be worth it in the end. I had these all picked out for a sample to showcase the Quick Curves Ruler at the shop where I work, but then we decided several runners showcasing different blocks would be better. There were all those gorgeous spring greens and that little splash of orange and those Modern Backgrounds, all loaded on the cart with nowhere to go. So sad! This is not on my "to do" list. Nope. Just checked the list again. Not there. This is definitely a distraction (known as a squirrel in this house, as a squirrel can distract the dog from just about anything). But these colors, used in Chic Country, would be perfect for my daughter. I would even use the QCR ruler she gave me for Christmas.... There is now a nice little "Quilt in Progress" beanbag sitting on these fabrics at the shop so they won't get reshelved until I cut off what I need, but the fabrics are not actually in the house yet. First, the blue one. Gotta go sew so I can finish the blue quilt then let the squirrel in! Nothing wrong with planning ahead!Such bright and sunny spring colors. Can't wait to see you use that new ruler with them.... you must test out the ruler after all. The ocean waves quilt will certainly be awesome when finished. Those HSTs will take a while, but as you said, it will be worth it - for sure! One step at a time and amazingly, you get there! 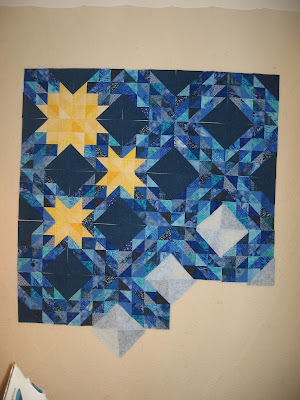 Didn't I tell you those blues and gold stars will make a great quilt? I id not tell a fib! Also you should know from my posts long ago that I love watching squirrels play, and have been known to let a few in my house too! *giggle* I don't remember any green ones, but if you bring in the orange ones too, I really think they would make nice pets in your house! ---"Love"
So you are saying that there is a squirrel, but it is still in the distance? This quilt is beautiful. I love the addition of the yellow stars and look forward to seeing your layout more. The ocean waves blocks will make a very pretty quilt! Love the yellow and blue together. What a fun quilt the orange and green fabrics will make. Hope the blue one is finished soon so you can start on a new project! I love the greens! Your blue quilt is coming along beautifully. This is coming along so nicely. I absolutely LOVE the colors. So relaxing! !